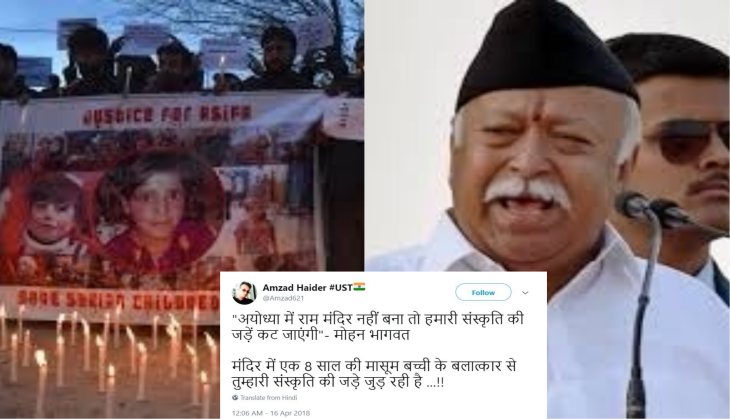 The Rashtriya Swayam Sevak (RSS) chief Mohan Bhagwat on Sunday commented on Ayodhya Ram Mandir that 'the root of our culture' will be cut if the Ram Mandir in Ayodhya is not 'rebuilt' The RSS chief comment came after the Kathua girl was brutally raped and murdered by 8 men and the civil society members staged country-wide protests across India against the sexual violence against women. Mohan Bhagwat made a comment at Viraat Hindu Sammelan at Dahanu in adjoining Palghar district, came amidst the matter currently pending before the Supreme Court for hearing. “But today, we are independent. We have the right to rebuild whatever was destroyed because these were not just temples but the symbols of our identity,” he said. According to the charge-sheet prepared by the Jammu and Kashmir Crime Branch officials, Kathua’s 8-year-old child was held captive inside a temple, where she was sedated and sexually assaulted for several days before being brutally murdered. मंदिर में एक 8 साल की मासूम बच्ची के बलात्कार से तुम्हारी संस्कृति की जड़े जुड़ रही है ...!! Ek or mandir banvana chahte ho taki ab AYODHYA me koi ASIFA jesa case samne aae ! मोहन भागवत बोल रहे थे की मन्दिर रीबिल्ट होना हिंदुत्व के लिए बहुत ज़रूरी हैं .